#2 Terriers broke a 1-1 third-period tie on sophomore Dante Fabbro’s power play goal and went on to defeat #16 Union College, 4-1, in the season opener, racking up the first September win in the program’s 96-year history. Sophomore Patrick Harper scored a pair of goals, replicating his two-goal effort in last year’s season opener vs. Colgate. He also added an assist, while freshman Shane Bowers had the final tally. The first period saw seven penalties meted out and the visitors used a power play to draw first blood. Brett Supinski took an Anthony Rinaldi entry pass between the dots, wheeled and fired the puck past goalie Jake Oettinger. BU knotted the score just over two minutes later, also with a man-advantage. Slick passing brought the puck to senior Nikolas Olsson who dished to Jordan Greenway on the doorstep. Dutchmen goalie Jake Kupsky stopped Greenway’s shot, but Harper flipped the rebound over Kupsky. Terriers dominated the final period, outshooting Union, 19-11, but the score remained tied midway through the period. 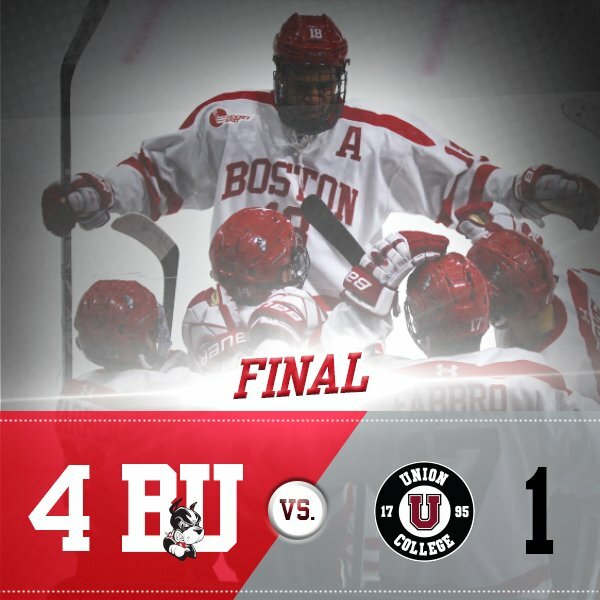 Fabbro’s game-winner came at the 12:11 mark with BU on a power play. The sophomore from New Westminster, British Columbia, zipped a pass to Harper in the right faceoff circle, sneaked into the left circle and one-timed Harper’s return pass high past Kupsky. With 1:14 remaining, Harper’s unassisted empty-netter on a breakaway extended the lead to 3-1. In the waning seconds, freshman Brady Tkachuk tracked down the puck in the Union end on a two-on-none and unselfishly flipped it to classmate Bowers for a tap-in into the empty net. BU outshot the visitors 43-32 and won 38 of 64 faceoffs with Bowers winning 14 of 19. Greenway and Tkachuk each fired seven shots on goal, while freshman Hank Crone had six. Oettinger stopped all 23 shots in the final two periods for a total of 31 saves. It's hard to expect much after such a short amount of practice, but overall BU played a solid game. I was surprised by the lineup in a couple ways - using seven defensemen so that all three freshmen could play was interesting, and not having Cloonan, Curry, or Phelps in there was also unexpected (though I have since learned that Phelps is injured). BU carried the play for the first few minutes, and then things evened out until the third period, when BU took control. Union was a formidable opponent - I don't see them having as big a drop-off as some had predicted. Their shorthand set-up was effective at clogging BU's passing lanes. In goal, Oettinger picked up right where he left off last year. He made some tough saves from shots in close, but made them look unspectacular as he usually does, due to great positioning. The one goal that beat him was from about 15 feet out in the slot on a spin-around, so tough for him to pick it up. On defense, Fabbro, Krys, and Hickey seemed to get the most minutes. Kotkansalo played a regular shift the whole game, other than the power play. Farrance's ice time appeared to decrease as the game went on - he seemed to mostly be out there on the Power Play over the last half of the game. He did start the rush that resulted in BU's first goal with a slick move around a forechecker in BU's zone--he pushed the puck one way and went around the forechecker the other way, picking the puck up in stride. Crotty's shifts were also spaced out quite a bit, though Quinn did have him out there with five minutes to go in a one-goal game. The defense didn't play great -- Union capitalized on a couple bad second period changes -- one resulted in a breakaway and the other a Power Play. At forward, the big story in my opinion is that Brady Tkachuk may be even better than advertised. He was a beast out there -- Union players were bouncing off of him all night long. He looks as strong as Greenway already, but has more speed and puck skills. While he likely won't lead the team in scoring, he will be at the top of all opposing team's concerns as they game plan for us. It's almost unfair for a team to have to deal with Greenway AND Tkachuk on the same night. Harper (who will lead the team in scoring barring injury) also picked up right where he left off, with a three point night. Bowers looked good, although I feel like his minutes dropped in the third period. Crone got a ton of ice time and played well, but showed a little nervousness. Melanson is definitely fast, and played pretty regularly, but he made some poor passes that looked rushed. Cockerill is also very fast and created a couple solid scoring opportunities. He should be in the lineup regularly. Amonte held his own, but I could certainly see him sitting some games. Overall a good win to start the season, and an entertaining game for the fans. ► ESPN’s John Buccigross was in the BU press box and tweeted his observations throughout the game. 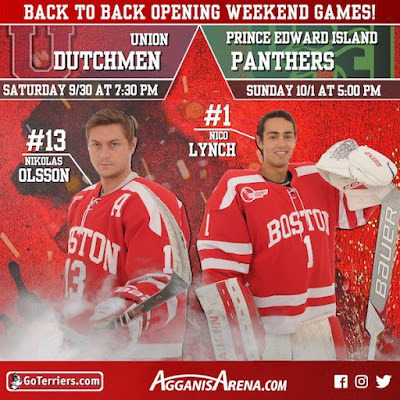 ►Terrier are back on the ice this afternoon for an exhibition game against the University of Prince Edward Island. Puck drop is at 5 p.m. Last season, BU thumped the Panthers, 10-2, with half of those goals scored by Harper. Clayton Keller assisted on two Arizona goals and Adam Clendening assisted on another as the Coyotes blanked San Jose, 4-0. Former Terrier captain Peter MacArthur has signed on with the ECHL Allen Americans. He played the past two seasons with the Adirondack Thunder, also in the ECHL, scoring 63 points in 63 games in 2016-17.